Transform the look of your bedroom with this elegant seven-piece bedding set. This collection features a luxurious microsuede finish and a black and grey color block design. This chic bedding set includes a comforter, shams, and decorative pillows. While the set itself is very nice if you have a thicker bed the set doesn't fit. The sides don't hang over enough on both sides to cover the sheets, I also had to pull the set down in the front to cover the sheets and the set doesn't go all the way up (you can't tell when you make the bed). Our mattress is only 15 inches. This comforter set is wonderful. 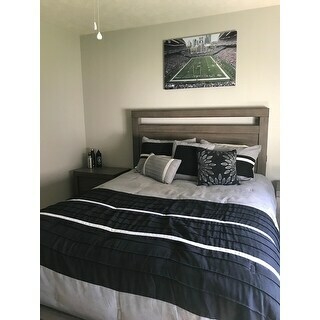 Just redid our master bedroom in grey with black and white accent colors. Comforter , bedskirt, shams and 3 accent pillows look great! Shipment arrived exactly on the day predicted and everything was in excellent condition. I believe it looks best with white sheets rather than the "silver" color that it states in description, but either color works! Thank you Overstock! This set is beautiful, warm, and made with quality! I love how it looks and the functionality. Luxurious and beautiful matches the curtains I bought from y'all too! I ordered a cal. king size, but it doesn't fit my bed properly. It hangs 16" on each side, but only 8" on the bottom. It doesn't look right on the bed. The bed skirt is also extremely poor quality. Even a gentle tug to reposition it causes the seams to tear. The fabric quality of the comforter isn't bad, but its not great. 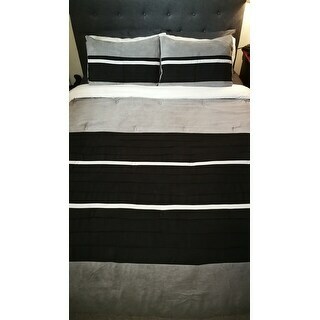 Its almost identical to a different comforter I paid $40 for ten years ago. I like that comforter, but I was expecting a comforter that costs three times as much to be at least a little nicer. Overall, I'm very disappointed. The primary reason I chose this comforter was because it was made specifically for cal. king sized beds. While they use a different sized bedskirt, it is the same exact comforter as the regular king size. I feel very misled. This is a beautiful set and I am very happy with the quality. 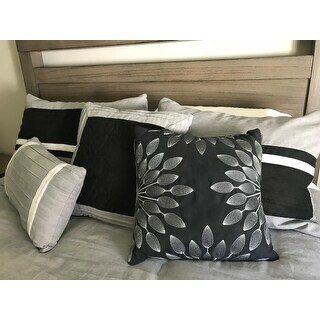 The pillow shams aren't very substantial though, so you may want to get a set of pillows with black pillow cases to prop behind them. The Comforter is not good for year round use. I have a feeling it won't be warm enough for the winter. It's more of a late spring, summer, and early fall. It's padding is thinner than the original picture. It's kind of "cheap" feeling, not worth the amount we paid. It's more of a $100 CAD or less Comforter for a Queen size mattress. Overall it looks decent and we're ok with it. But if you think it's high quality, it really isn't. You can see from our picture that it can look good when detail is put in to setting it up. There were some threads that needed to be cut off when we got it. Hopefully everything stays together with more use. We've had it for almost a month. The colors are exactly as represented in the picture. It's comfortable and the perfect thickness. Seems pretty well - made so far...I've had it about a month. The underside is silky which I like. The only downside for me is that the top is suede. It feels velvety and I wasn't expecting that. I hadn't noticed it in the description. We got this bedding for my son's room and it is just terrific. Looks great and has held up well. Really nice comforter set. We used it in a guest bedroom/man bedroom and it matched perfectly with all of our neutral colored decor. It did fade a bit from the sun through the window, but otherwise no complaints! A little disappointed in quality of this products, stitching is off in some places, bed skirt is not gray at all. It was exactly like the pictures and matched perfectly to the description. Very nice! Beautiful bedding for my guest bedroom. 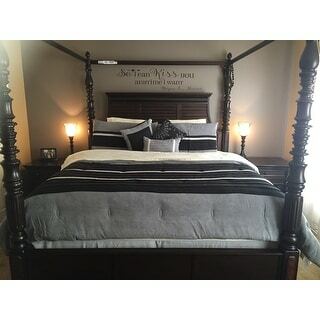 It goes great with the large black and white black bear canvas that hangs over the bed. Guests rave about how comfortable the bed is. Very soft, nice colors. Bought for my son and his Queen sze bed and it fits perfect. Great price, worth the money! Not what I expected as far as quality but still a great set. The comforter is very thin and light. And it does not come with sheets which I seemed to have missed when I ordered it. My son absolutely love this comforter. It's a little thin to me, but if he like it, I love it. The black and Gray in this comforter really brought out his black and Gray curtains. "Is the black material suede also, or just the gray material?" Yes Black is also micro suede! Yes it is also suede. "Where can I find the Madison Park Porter bedding set in a queen size?" Currently the queen size is in stock. 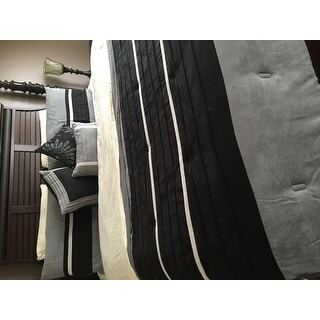 "Is this Madison Park Porter Black/ Grey Comforter Set good for a newlywed couple to sleep in? My husband and I just need something thick but, warm and stylish. Is there any other married couple using this comforter? I'm wanting to get it." "Is the black strip only in the middle ? With solid grey on top and bottom?" Yes. Solid grey on top and bottom. "Does the black panel showing actually cover the whole front? Or is it solid grey on top with black panel followed by solid grey again?" I still need clarification- How wide is the black strip? Does it take up the whole front or is it the grey just across the middle section? "Is the comforter down? If not, what's the fill?" I bought this for my son, so I am not sure. I do not think it is down though. It is not down. The fill is polyester down alternative. "Is this Taupe/black or Grey/black? Description says Grey and to order you have to pick Taupe. Thanks, Deb"
You might want to email them and ask. I bought this a few months ago and it is definetely grey and black. I only had the option to select the size, no color option to choose. It is grey and black and it is beautiful! I bought two sets.